The USGA Museum, currently located adjacent to the USGA Headquarters, has long been a mecca for those passionate about the game. Some 20,000 avid golfers make the pilgrimage to the Somerset Hills each year to visit the museum. This elegant brick three story Georgian colonial mansion, designed in 1919 by John Russell Pope, has been home to the USGA Headquarters & Museum since 1972. 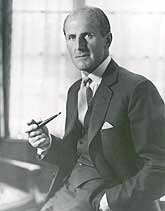 In 1919, Thomas H. Frothingham (1891-1971), a stockbroker and partner at Potter Brothers & Company, commissioned architect John Russell Pope to design the Georgian colonial mansion. And wait until you hear what happened to the other owners before the USGA got it. Funny thing though, the USGA is in the Liberty Corner section of Bernards Township, not Far Hills! Founded in January 1936, about a year before the National Baseball Hall of Fame, in Cooperstown, NY, the USGA Museum was the first museum in the country dedicated solely to sports. George Blossom, a USGA committee member, approached the group with the idea of creating a museum in 1935. 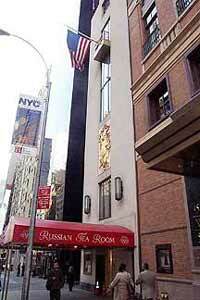 It opened the next year in New York City. In the 72 years since the creation of the museum in 1936, the collections have grown to comprise more than 50,000 artifacts, a library of more than 30,000 volumes, more than half a million photographic images, and several thousands hours of historic film, video, and audio recordings. Together, the museum’s collections present a comprehensive history of the game’s development in the United States over the course of nearly 250 years. They are also the finest collection of golf memorabilia in the world. For the first 20 years after the 1936 decision to create a dedicated USGA golfing museum, the collection was displayed in the association’s lobby, corridors and offices. In 1950, the USGA moved into what became the first Golf House, a five-story brownstone on 38th Street in the Murray Hill section of Manhattan where it dedicated two floors for the museum. The New Yorker Magazine referred to the USGA Museum as “the Louvre of the golfing world.” Click Here to see the USGA 1950 Golf Journal Magazine entry. Finding a new home for the USGA’s headquarters and museum was one of the great legacies of Ken Gordon’s tenure on the Executive Committee. Ken Gordon spent nearly 20 years of his life serving the boards of the Metropolitan Golf Association and the USGA. From 1968-75, he served on the USGA’s Executive Committee, including two years as secretary (1974-75). During that time, he chaired the Museum Committee and helped lay the groundwork for the Association’s move from New York City to Far Hills. 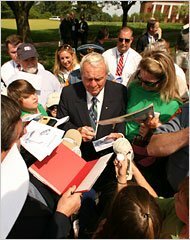 Gordon was a member of Montclair Golf Club in New Jersey, where one of his fellow members was the famous golf course architect, Robert Trent Jones Sr. In the early 1970s, the USGA’s Executive Committee had discussed moving from Manhattan and Jones had heard about some property in Far Hills that was coming up on the market. The USGA, through the work of Gordon and others on the Executive Committee, purchased the property from David Potter. The Museum at Golf House opened its doors in the summer of 1972. 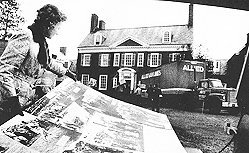 At the USGA Executive Committee meeting on January 22-23, 1970, Mr. Philip Strubing 2nd, a trial lawyer and President of the USGA in 1970-71, noted that the NYC Golf House was no longer large enough to accommodate the USGA and the association, the museum and library. 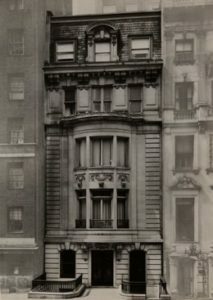 Subsequently, at the June 13, 1970 Headquarters Committee meeting, USGA President Strubing mentions a possible building at 27 East 39th Street, then owned by the Christian Herald magazine for $1,050,000. The committee was also considering acreage in Stamford and Greenwich, CT being advised that acreage would cost between $50,000 and $75,000 per acre. Three acres on Old Post Road was under consideration for $275,000. The decision was made to keep looking. As the search continued, Rappahannock Estates near Warrenton, Virginia was also considered. The 2,500 acre property that was later rejected due to soil tests noting constraints to create a top rate golf course on the property. Executive member Mr. Strubing and Robert Trent Jones noted the availability of a mansion only one hour and 15 minutes from NYC which he recommended as a potential USGA headquarters. Containing 65 acres, and an asking price of $500,000 presently in bankruptcy from a Mr. David Potter, the Headquarters Committee visited the property and considered the structure “eminently suitable” for USGA Headquarters. They also noted and additional 150 acres owned by Mrs Percy R. Pyne II (her husband was a former committee member and her son Percy Pyne III was a committee member at the time). Jones had hoped the acreage be purchased for $4,000 per acre and construction of a golf course could cost $700,000. Mr Strubing said “if a course were built, Mr. Jones would expect to be the architect.” Three possible courses of action followed:purchase the Potter and Pyne properties and immediately begin construction of a golf course; purchase both and defer course construction; or purchase only the Potter property. The outcome was to seek an option to acquire only the Potter property for a $10,000 option. If agreed, the USGA would then negotiate for the 150-acre Pyne property. At the Executive Committee meeting on June 12, 1971, the Headquarters Committee authorized “to acquire an option to buy an estate near Pluckemin and Liberty Corner”, New Jersey paying $4,500 for an option to buy the estate for $450,000, so long as use variance and zoning laws were approved. An additional $100,000 was estimated for building renovations. The USGA quickly received a “use variance” in June 1972 to move its non-profit business operations here with the stipulation that is be for the USGA only. The land was zoned three-acre residential. The motion was noted and unanimously decided to acquire the property. The decision was announced publicly at the Merion Golf Club near Philadelphia(host to more USGA hosted US Opens than any other location and host in 1971) on Wednesday, June 16, 1971. Subsequent purchases were made adding to the 62-acre Potter estate purchase. A 14-acre purchase of what’s been noted as the neighboring Vance property; a 13 room converted (was the original house’s stable) carriage house w/stables in 2000, and a 10-acre adjoining Lee property parcel, for a total of 86 acres. 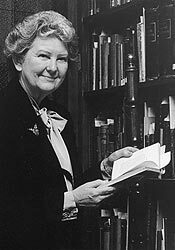 USGA Museum Director – Janet Seagle, Curator and Librarian of the USGA Museum in 1972. On March 8 1972, the USGA began the drive to the suburbs, 30 miles west of Manhattan to the new 86-acre campus. The move was in full swing. One of the key reasons for the USGA’s move to the Somerset Hills was extensive outdoor space. The concept of creating a golf course at or near the USGA was in full swing in 1972. In their annual report of the Executive Committee, it was stated “the possible construction and operation of a USGA golf course. Land has been selected and financing on reasonable terms has been arranged. Johns-Manville Corporation, a company founded in 1858, and a big player in the development of The Hills residential project in Bedminster/Bernards Twp, offered to construct a golf course for the USGA. Estimates for such a facility were about $1,500,000. Johns Manville would then rent the course to the USGA for $156,000 per year plus taxes, with an option to buy the property at any time over the next 20 years for the original construction price, plus an additional 3% per year for appreciation consideration. The course would be built on 140 acres which Johns-Manville had the option to purchase (option expired on July 15, 1971) plus 75 acres land they already owned. The 3% appreciation feature didn’t sit well with the committee, they opted to table the discussion and a course never materialized. There were also comments made in the March 16, 1972 edition of the Bernardsville News that a possible 9-hole course was discussed on the current property according to USGA Public Relations Director Robert T. Sommers. From the air you can see that the NJ National Golf Course and Harry Dunham Park were close to being full USGA properties. 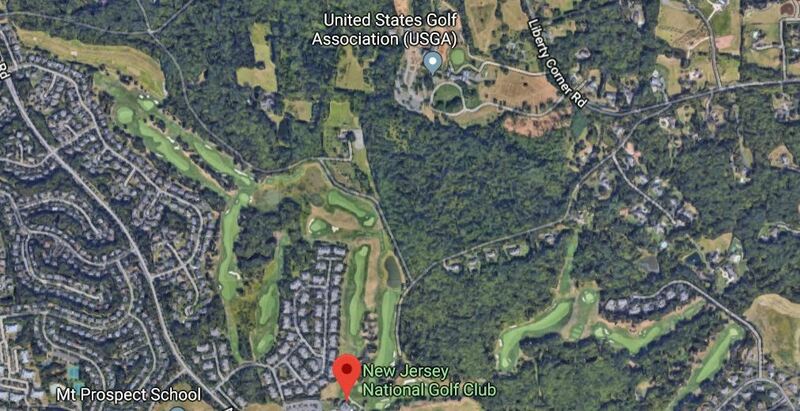 The only course that did materialize in the end was the development of the New Jersey National Golf Course which is near the USGA facilities, but has no affiliation to the USGA property. 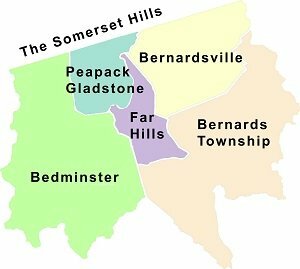 Located in a Somerset County region noted as the Somerset Hills, Far Hills was actually part of Bernards Township until seceding in 1921. Rising taxes led the 200 residents of Far Hills to decide to separate from Bernards Township and to incorporate as a Borough. The local property tax rate jumped from $2.72 in 1919 to $3.53 in 1920. In actuality, the USGA Headquarters and Museum is not in Far Hills at all. 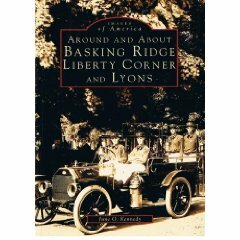 The USGA Headquarters and Museum is physically located in Bernards Twp, a township comprising of Basking Ridge, Liberty Corner, Lyons, and West Millington. Far Hills is actually only the mailing address. Therefore, if a proper location were used, the physical address is closest to the Liberty Corner section of Bernards Twp. Referred often as part of The Somerset Hills, the Somerset Hills is a region in Somerset County that includes Bedminster, Bernardsville, Bernards Twp, Far Hills, Peapack & Gladstone. 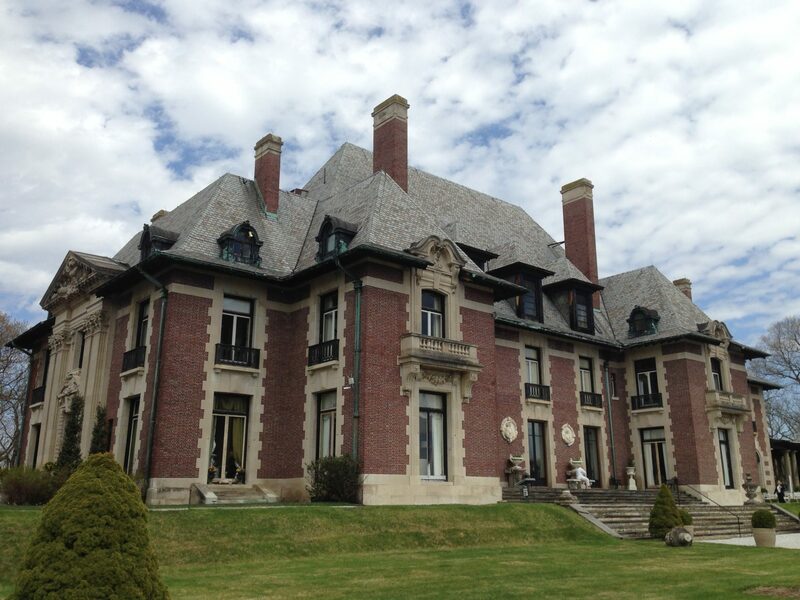 In 1919, Thomas H. Frothingham (1891-1971), a stockbroker and partner at Potter Brothers & Company, commissioned architect John Russell Pope to design the Georgian colonial mansion, and Ferrucio Vitale, a landscape architect, to design the grounds.on 300 acres in Bernards Township. The design is sometimes referred to as a “Maryland 5 part Plan”: three large sections with two adjoining areas connecting structures off the center area. The structure and grounds included a living room on lower left, children’s bedrooms above left, gun room, dining room on right, kitchen/service wing on back right with staff bedrooms above, tennis courts, pool, bridle paths, orchards, & vegetable gardens. Frothingham ran into tough times. And due to Frothingham’s bankruptcy as partner of the brokerage company Potter Brothers & Company, a failed suicide attempt, a divorce from his wife, and moving to Mexico to avoid bankruptcy prosecution, he died in Mexico and the property was finally sold in 1926. 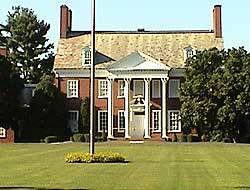 The Dogwood estate was sold in 1926 to Mr. John Sloane and renamed Pastureland. John Sloane was the grandson of founder of the famed W. & J Sloane (1843-1985), a famous furniture and flooring store in NYC that catered to the well-to-do. 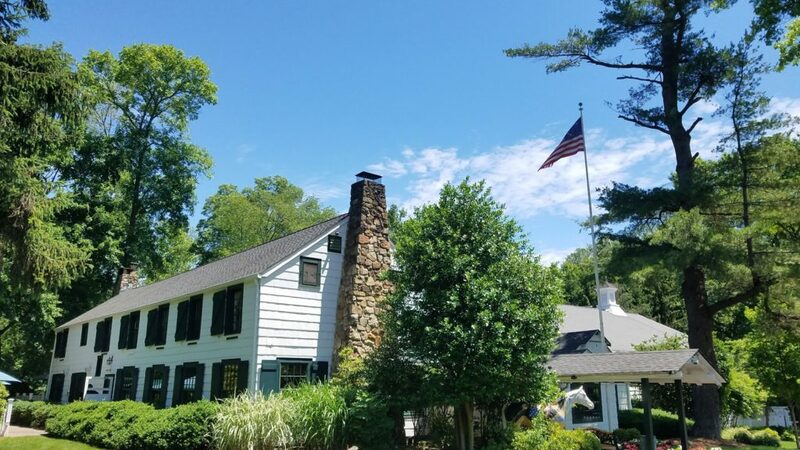 A carriage house on the property was also home to former Secretary of State Cyrus Vance,(1926- 2002) who recently lived on the estate before his death in 2002. Vance married John Sloane’s daughter Grace Elsie Sloane back in 1947. Lastly, in 1972, the USGA buys Murmur from David Potter III and renames Murmur, Golf House. The architect John Russell Pope was no slouch when it came to creating powerful architecture. In addition to designing the original Dogwood estate for Thomas Frothingham, Pope also designed the Jefferson Memorial, the West Wing of the National Gallery of Art, The Abraham Lincoln Birthplace memorial, the British Museum, Lord Memorial Fountain (Somerville-1910) and Washington Headquarters Museum (1935) in Morristown to name just a few. Beginning in the early 1970’s and through 2003, the USGA considered moving its museum to Rhode Island, Colorado, California, Atlanta and even to the old Russian Tea Room in New York City before deciding to expand its current site in the Somerset Hills of New Jersey. For two decades , the USGA Museum Committee’s mantra seemed to be “find a home anywhere but in Far Hills”. It explored several urban locales including Atlanta and Monterey, CA, arguing such a move would boost attendance to 300,000, above the 10,000-25,000 visitors who annually toured the museum at its remote New Jersey setting. 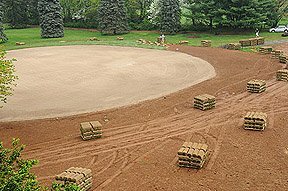 Support for the move dwindled when the USGA learned the true cost of the project. The addition of a necessary seventh floor to the Tea Room pushed renovation costs alone to $50 million, according to Jerris. The committee deemed such expenses were excessive, and in 2004 the USGA sold the property for $20 million, recouping its initial investment and subsequent expenses. For the first 16 years of its existence, the USGA had no formal home to display their collection of golfing memorabilia and artifacts. It forced USGA officials to re-evaluate their approach. The resulting discoveries altered the essence of their museum vision. Jay Rains, chair of the museum committee since 2004, says officials were surprised to learn only two museums in the world – the Smithsonian National Air and Space Museum in Washington and The Louvre in Paris – have a positive clash flow on operations (excluding development and charitable contributions). 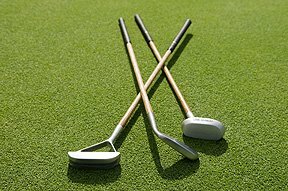 That confirmed the difficulties of the museum business, in general, and underscored the limitations of golf exhibits, in particular. The original World Golf Hall of Fame in Pinehurst, N.C., flourished on rainy days when golfers had nothing better to do but closed after a drought of visitors in 1994. An updated glossy version opened in 1998 as the centerpiece of the World Golf Village in St. Augustine, Fla., and promised – along with an adjoining IMax theater – 500,000 visitors in its first full year. But there haven’t been enough rainy days in the Sunshine State, either. Attendance hasn’t met expectations. More guests still come to watch an IMax movie than to see special exhibits heralding Hall-of-Famers. Percy Pyne – The 3rd Intercollegiate National Champion back in 1899 with the Princeton golf team and long time Bernardsville resident. Max Behr – Course Architect, Somerset Hills Country Club Champion and Far Hills resident. Brian Duffy – Endeavor astronaut and “Shuttle putter“. Paul Ramina, the director of grounds at nearby Hamilton Farm Golf Club, and Hamilton Farm’s superintendent Pat Husby also offered their services in training the USGA grounds staff on cutting-edge green maintenance practices. So, the USGA decided to kick the Scots to the curb and tell the story of American golf through the lives of those colorful characters who played in the USGA’s major championships — with U.S. history mixed in. Jerris immediately began a scavenger hunt for the 2,000 items to display. Over three years, he pried open dusty trunks in storage. He contacted the families of the stars of yesteryear and the superstars of today. He begged golf collectors. He bid at auctions. He spent a couple of hours each day scouring eBay, and still does. With an annual budget of $100,000, he is snatching up as much U.S. golf history as he can. From there, visitors can head to the Test Center to hit a mashie (that’s a 5-iron) or the latest Big Bertha and argue whether Nicklaus, when compared to Woods, was hampered by the equipment of his day. The USGA Museum, located adjacent to USGA headquarters, has been renovated and expanded. The original Museum building was completed in 1919 and designed by noted American architect John Russell Pope. The renovated building features the Ben Hogan Room and Bob Jones Room, together with the addition of a new Arnold Palmer Room. The museum staff spent much of the 2005-2008 digging deeply into the vast and extensive archives at its disposal. As a result, the new exhibits feature hundreds of historic photographs, as well as numerous multi-media, audio-visual presentations. Visitors now have an opportunity to learn about the game through entertaining interactive displays located through the exhibition galleries. The 16,000-square-foot addition, called the Arnold Palmer Center for Golf History, features 5,000 square feet of galleries, a research room and state of the art storage areas for the museum’s 50,000 artifacts, 30,000 library volumes, more than a half-million photographs and several thousand hours of film. “I have spent 20 years of my life around this institution, working with these treasures, thinking of the great stories and wondering if there would ever be the chance to transform this place and I think we have done it,” Jerris said. A special thanks goes out to Rand Jerris, Ellie Kaiser, and Nancy Stulack from the USGA Museum for for granting access to the stories, artifacts and the museum. Rand Jerris has served as Director of the USGA Museum since 2002. A long-time New Jersey resident, Jerris holds a B.A and M.A. from Williams College, and a Ph.D. in Art and Archaeology from Princeton University. Jerris is responsible for overseeing all aspects of the daily operation of the Museum and Archives, as well as the long-term development of the facility and its collections. Ellie Kaiser has served as the Photo Editing Coordinator for the USGA Museum since 2006. Originally from Indianapolis, Indiana, Kaiser relocated to New Jersey in 2005. Kaiser graduated from Indiana University with a B.A. in Journalism and a minor in Art History. She is responsible for all daily requests for images in the collection, and editing onsite during the championship season. A native of New Jersey, Nancy Stulack joined the USGA staff in 1985, working in the USGA Foundation Department before joining the Museum staff in 1990. She is responsible for the daily operation of the USGA Museum’s Research Center, as well as administration of the Library Collection. 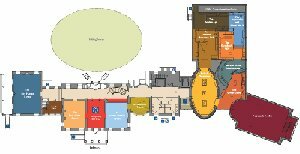 Click to enlarge to see a larger version of the floor plan of the USGA Museum. The floorplan for the USGA has changed dramatically. Floor Plan of the USGA Museum and Arnold Palmer Center for Golf History. 1919 Architect John Russell Pope hired by stockbroker Thomas Frothingham to build an estate on over 300 acres in what was then known as Bernards Township. 1921-1926 Thomas Frothingham lives in the 300 acre Dogwood estate 6 years, finally declaring bankruptcy and forced out of the estate since it was “built with “ill gotten gains”. 1936 January – USGA Museum established (a year before Baseball Hall of Fame) First museum in the US dedicated to sport with over 5,000 artifacts. For the first 14 years of its existence, the museum had no formal home and artifacts were displayed throughout the USGA offices in New York City. 1926-1955 John Sloane (1893-1971) moved from Peapack. Renamed Dogwood to Pastureland. Daughter Grace Ellie married Cyrus Vance (Secretary of State for President Carter) there. Elsie died in 1947. 1950 “Golf House,” located at 40 East 38th Street (Murray Hill section- Between Madison & Park) in New York City, becomes the Museum’s home (four blocks from Grand Central) dedicating two floors to golf artifacts. 1955 Pastureland is sold from the Sloane’s w/ 62 acres to David Potter III. Pastureland is renamed Murmur. 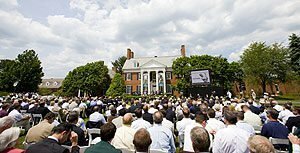 1971, June 16 Decision was announced publicly at the Merion Golf Club on Wednesday, June 16, 1971. USGA buys 62 acre estate in bankruptcy from David Potter III and renames Murmur to Golf House for $450,000. 1985 USGA major renovation of Golf House expanding the museum to two floors and all new exhibits. 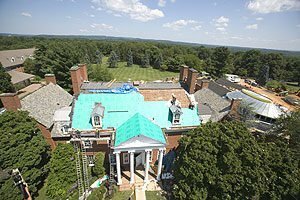 2004 USGA, after much debate, sells the Russian Tea Room for $20 million, deciding to keep the USGA museum in Bernards Township. 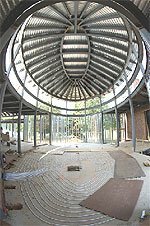 2004 Museum completed an extensive period of internal review, which led to plans for the Palmer Center. Designed to become the premier institution in the world for the study and education of golf history, the Palmer Center is a critical step toward strengthening the museum, its programs, and its role within the USGA. Visitors will be able to purchase a USGA Membership on-site. The reduced admission fee for USGA Members and discount in the gift shop will apply immediately. To become a USGA Member now, please click here. For groups of 10 or more individuals, the USGA Museum offers a 60-minute guided tour, conducted by members of the Museum staff. The group rate is $5 per person. For additional information on scheduling a tour, please contact the Museum at 908-234-2300; or by email at museum@usga.org.